A LEDBURY youngster will never forget his visit to this years' Hay Festival, because he got to interview one of his favourite authors on the big stage. Bear Dhunnoo Kattan, aged 10, entered a competition by submitted three emailed questions to writer Anthony Horowitz, and little did he guess where those questions would lead him. 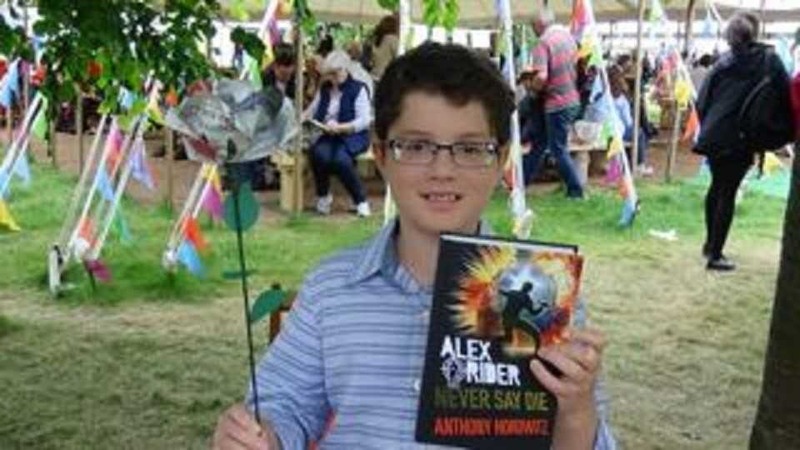 His mum, Asha Dhunnoo said: "On Friday June 2, we were surprised to discover that he was going to be on stage for the entire session in the Baille Gifford tent, interviewing Anthony Horowitz, alongside the main interviewer. "In addition to his three questions, he was encouraged to participate fully in the interview and came up with three or four 'off the cuff' questions as the event progressed." Ms Dhunnoo added: "Prior to the interview he was invited to 'meet and greet' Anthony in the green room. It was all a lovely and exciting opportunity for Bear, who is a great reader, and particularly of the Alex Rider series which he is working his way through. He has been going to the Hay festival every year since he was very young. "His questions to Anthony Horowitz included asking what was his inspiration to write the latest book in the series and talking about the gadgets involved." Horowitz is widely regarded as one of the UK's most versatile and talented authors, having written more than 40 books. These include the bestselling teen spy series Alex Rider. The Alex Rider series is estimated to have sold 19m copies worldwide. He has also been commissioned by the Conan Doyle estate to write new Sherlock Holmes novels, to great acclaim and success. Credit to Gary Bills-Geddes, Worcester News Source.